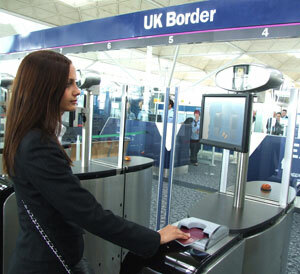 The UK Border Agency is encouraging UK and other European with passports issued since 2006 to make use of the new border entry gates with installed facial biometric systems at Stansted airport, according to a Travel Bite article. Use of the gates do not require any sort of enrollment by a citizen as European passports issued in the last three years automatically include an electronic chip containing the necessary information for using the gate. Since the trial of the system started last December, the gates have seen almost 160,000 passengers pass through it, and officials from the Border Agency at Stansted expect it to extremely ease the lines of people waiting for official entry into the country. The trial has been extended to October so that officials will be able to view its use through the summer traveling season.